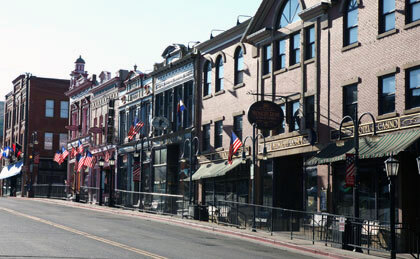 Just west of Colorado Springs, in the presence of mighty Pikes Peak, spend a day exploring the Cripple Creek area. You’ll get to peek back into history (and even prehistory), where Gold Rush fortunes and paleontological riches are revealed. About 35 million years ago, a lakebed located smack-dab in the middle of what is now Colorado was teeming with life when massive volcanic eruptions flowed over the area, effectively freezing in time millions of plants and creatures. At the Florissant Fossil Beds National Monument’s visitor center — about half an hour from Cripple Creek and a good starting point for the day — the finest examples of the area’s prehistoric specimens, including insects, leaves, flowers, birds, fish and more, are on display in the forms of incredibly detailed fossils. Two nearby self-guided trails, the Ponderosa Loop and Petrified Forest Trail, provide pleasant, easygoing forays into the surrounding natural landscape. Heading to Cripple Creek along County Road 1, you’ll be dazzled by the lush and mountainous panoramas passing by your windows. The route is just a short leg of the more extensive Gold Belt Tour Scenic and Historic Byway. Enjoy the high-country beauty and consider extending your stay to explore more of the byway. As you might guess upon arriving in Cripple Creek and discovering the Victorian-style brick facades of historic downtown, the town first came to life in the middle and late 1800s when the Gold Rush lured fortune-seeking miners to the area. Get a hands-on look at the gold-mining era with a tour inside one of the area’s mines. At the Mollie Kathleen Mine, you’ll don a hard hat and descend a thousand feet below ground to learn about historic and modern-day mining techniques, see veins of gold and ride in a mine cart. Once back above ground, consider a ride on the historic steam locomotive, the Cripple Creek and Victor Narrow Gauge Railroad (available late May to October), which takes you through the historic gold mining district. Visits to the Cripple Creek Heritage Center, the Cripple Creek District Museum or the Homestead House are also worthwhile ventures into the town’s colorful past. Stroll Bennett Avenue, where nostalgic street lighting, wide sidewalks, shops, restaurants and more can fill a leisurely evening. Had enough history for the day? Join modern-day fortune seekers at the town’s numerous blackjack, craps, roulette or poker tables. As one of a handful of towns in Colorado that allows gaming, Cripple Creek has more than a dozen casinos. Whether you end up cutting your losses or collecting big winnings, make sure to save time in the evening to see a professional musical, comedy or melodrama at the lovingly restored Butte Theater. Photo courtesy of the City of Cripple Creek.